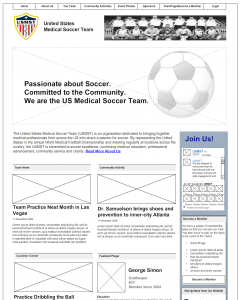 In 2010 the United States formed it’s own team to be part of the World Federation of Medical Soccer Teams. Only a few years later the US has been selected as the site for the 2015 international tournament. 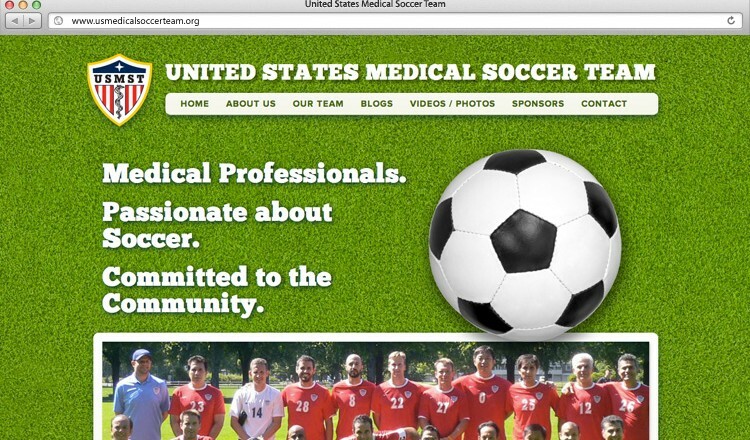 With that in mind, and with a growing need to have a professional face for their fans and a place to provide solid info to its members, the USMST decided they needed a new website. Club President Gautam Nayak came to me with a tall order – create a beautiful new site that was pleasing to visitors and quickly told what the team was about while at the same time creating a site that would serve as a logistical hub for the team itself. Gautam wanted a central location for securely storing members information, information they could update themselves, and being able to use that info for his own managerial purposes. With the abundance of information and possibilities for how this site could go we decided to start by wireframing the major sections of the site. Gautam was great to work with, able to see the ideas behind the wireframes and help guide the layout. With the organization spread across the nation, Gautam wanted this site to be a central place for communication with his team. The new website helps with this by giving a quick overview of each blog category on the homepage. Coaches can write in articles for their team, and there is a showcase for what doctors are doing to help in their own community. Members can also log in to access private team information and documents. Keeping track of dozens of team members, each with their own skillsets, memberships, and uniforms, can be overwhelming. A central part of this project was creating a database for the team. On the backend Gautam and coaches can set rosters, update information, and export data on members that match certain criteria (say, that are going to the next tournament). Each team member can also log in and update all their profile themselves, saving the coaches hours and hours of work. But the power of this site doesn’t end there. The same database also displays selected team information to the public, giving stats and a bio for all the current team members. If you’ve been to an event where everyone is taking pictures, you know how fun it is to get home and look through the photos. 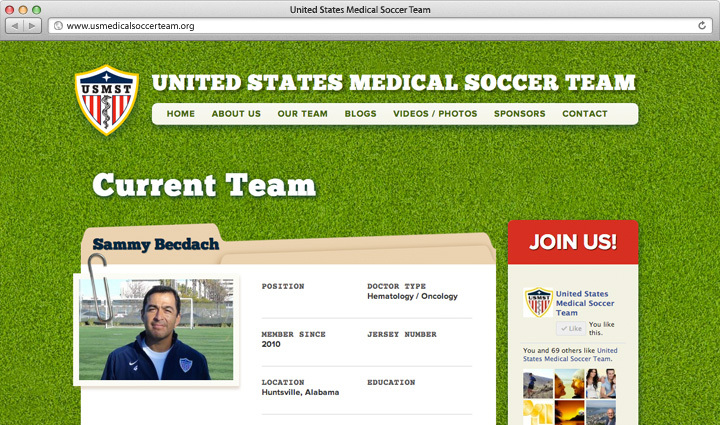 The new USMST website has custom galleries pages where logged-in members can upload their own photos. After review by the admin the photos are loaded directly into the gallery for everyone to enjoy. Brad always seems to find new and exciting ways to convert ideas and client direction into beautiful and unique website designs. The quality of his work, turnaround time, and attention to detail are all top-notch. Brad’s work consistently impresses. He has a great knack for designing material that both fits our mission and pushes our look to be new and fresh and innovative. Working with Brad is a delight. It is a collaborative venture that engages the creative process. His patience seems endless—in spite of how much we test it. Brad and Apt Design an ideal fit for us. His design work and attention to detail is impeccable. He’s also pushed me, and our team to become better designers. When I look at finished work from Brad – I don’t see his face all over it. It’s not about him – it’s about the design. When I look at a finished project and see a happy client, happy budget and happy timeline – well Brad’s face is all over that.